« Everything old is new again! This recipe was inspired by a dip that my sweet mother-in-law made for us before a family dinner get-together last week. It was AMAZING – beware, very addictive. 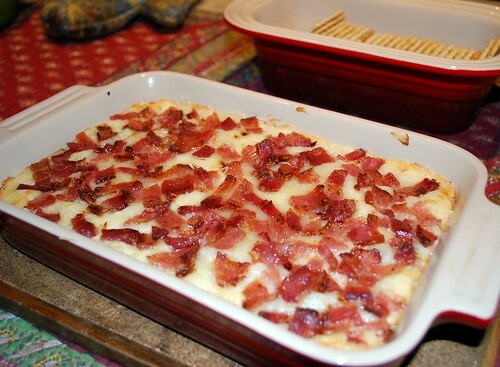 The tangy and stringy swiss cheese, the creamy and luscious base, the flavorful sauteed onions, and the salty smoked bacon blend together to bring out the best in each flavor and texture. Preheat oven to 350 degrees. Grease a pie dish or other small oven-save dish with cooking spray and set aside. In a medium bowl blend together cream cheese, sour cream, and mayo until creamy. Stir in 3/4 cup Swiss cheese (about half). Season with salt and pepper to taste. 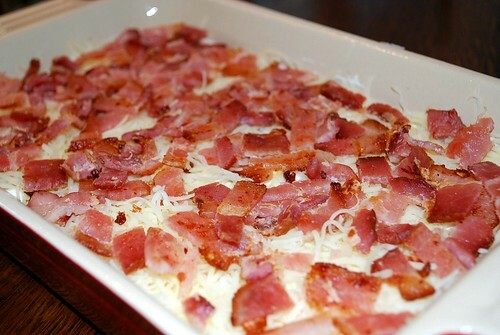 Saute your onions for about 5 minutes over medium-high heat using 1 tablespoon of olive oil or reserved bacon drippings. Add to the creamed mixture and stir until evenly distributed. 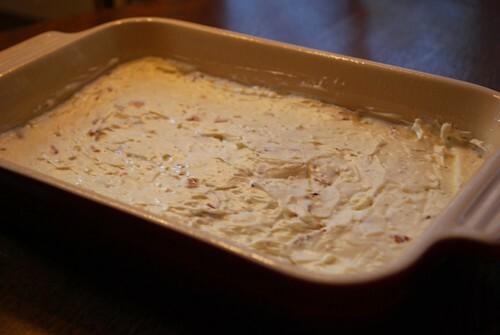 Spread this mixture evenly in the bottom of your prepared baking dish. Next, sprinkle the remaining swiss cheese over the top of the creamed mixture. Finally, sprinkle the bacon evenly over the top. Season with a little bit of freshly ground pepper on top. At this point, you can cover it and put it in the fridge for up to 5 days or continue and bake it up! 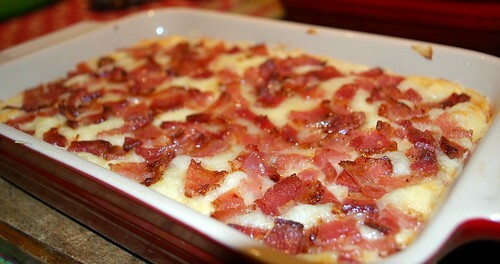 Bake for 15-20 minutes or until dip is bubbly and cheese begins to turn golden brown. Serve with crackers or chips!